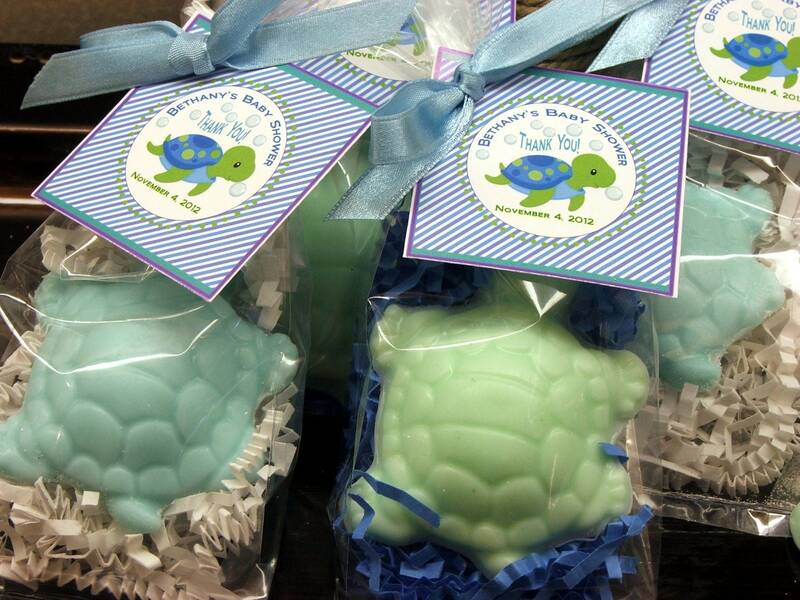 This listing is for 10 Turtle Soap Favors in your custom colors and scents. Perfect for baby showers, bridal showers, birthdays, weddings and more!. Each favor includes one sea turtle soap which measures apx. 2 1/2" long and 2 1/4" wide about 1" thick. Ingredients: Coconut oil, palm oil, safflower oil, glycerin, shea butter, purified water, sodium hydroxide, sorbitol, sorbitan oleate, soy bean protein, titanium dioxide, micas, cosmetic safe glitter, fragrance oil, may contain cosmetic safe glitter. We offer three packaging options for every budget. Select the packaging option that fits your needs. Please note listing pictures depict "THE WORKS". You will select a packaging option from the drop down menu when ordering. ******JUST THE SOAPS - With this option each soap favor will be packaged in a cello bag only. No ribbons, tags, or paper shred are included in this option. This is a great option for those who will be making their own tags and adding there own ribbons. ******ADD TAGS & RIBBONS - With this option each soap will be packaged in a cello bag with coordinating ribbon and generic tag. No paper shred is included with this packaging option. You will be able to personalize the tags with a message. We will send a tag proof for approval before packaging. ******THE WORKS - This is our most popular option for parties. Each soap is nestled in paper shred in a cello bag, tied with coordinating ribbon and custom tag with your personalized message. We can even coordinate the tags to match your invitation, just send a convo and attach a jpg and we'll create a custom tag just for you! We'll send a tag proof for approval and your perfect favors arrive ready to pass out at your event. 2) SOAP COLOR(S): Choose one color per set of 10. 4) RIBBON COLOR, if applicable. 6) PAPER SHRED (THE WORKS OPTION): light blue, kraft brown, red, yellow, pale blue, green, lime green, pink, bright pink, purple, lavender, teal, white, ivory. 7) PARTY COLORS so we can coordinate the tags, if applicable. ***We schedule all orders for production by party date typically apx 14 days before your event date unless an earlier ship date is requested prior to purchasing. If you would like an earlier ship date, indicate the date you would like delivery by in the notes to seller at checkout. We still require 5-7 business days production time for all orders. We ship USPS Priority Mail (2-3 day) and most orders are delivered on or before the Monday before your weekend party. Tracking information will be e-mailed to your Etsy e-mail address when your order ships. ****Please be sure to type all custom information required in the NOTES TO SELLER AT CHECK-OUT***. We will not schedule your order for production until all custom specifics are provided. If we need to contact you, we will do so by sending a convo to your etsy e-mail address. WHEN WILL I GET MY ORDER? All soap favor orders are scheduled for production by party date typically 2 weeks before your party date. This allows time for production of your soap favors to ensure they are perfect and also allows sufficient shipping transit time so they arrive well before your party! Typically we ship no later than the Saturday one week before your party so the order usually arrives by the Monday before your party. NEED A RUSH ORDER? We do understand that things happen and sometimes a last minute order is needed. So relax, as we do allow room in our production schedule for a few RUSH ORDERS each week and can get some orders out the door within 2 business days from the time the order is placed IF ALL CUSTOM information has been provided. Need a RUSH? Just send a convo and we'll do our best to accommodate you! These were a hit at the bridal shower! Thank you so much for the quick delivery!! They are so cute!! Absolutely adorable items....so well crafted. Stellar customer service, speedy shipment. Due to the nature of our custom orders and personal care items, ALL SOAP SALES ARE FINAL. SOAP BARS and GIFTS - Our cold process soap bars SHIP via USPS First Class Mail within the continental U.S. if you are buying items your order may ship via USPS Priority Mail, FEDEX or UPS Ground. 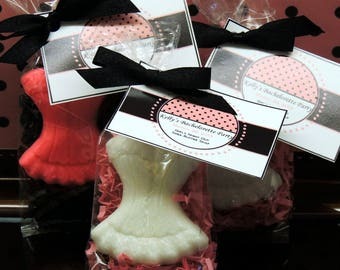 CUSTOM SOAP FAVOR ORDERS - We ship most custom orders via USPS Priority Mail which is typically 2-3 day TRANSIT time. We also ship UPS Ground for shipping larger orders and UPS TRANSIT time is anywhere from 3-5 business days depending on your location. Shipping times provided by third party shippers are estimates and we do not guarantee delivery dates.. You will be provided a tracking number when your order ships so you may track your shipment. Please check your e-mail address for notification when your order ships. Insurance may be purchased by Buyer for an additional charge - please contact us prior to purchase to add insurance to your shipment. We take great care in packaging your items to ensure they will arrive to your location safely and intact. If you have a concern you should request and purchase insurance for your package. If you purchased USPS insurance for your package it is your responsibility to file any and all claims for damage and we will assist you as necessary in the filing of your claim. If your item has been shipped via UPS your package is automatically insured and you will be asked to retain your packaging for examination in filing a claim. We love custom SOAP party favor orders. Just convo us for details and we can set up a special listing for your custom order! Choose your own colors and scents! Keep in mind that custom orders are scheduled for production by party date typically 2 weeks before your party and will ship no later than the Monday before your weekend party.